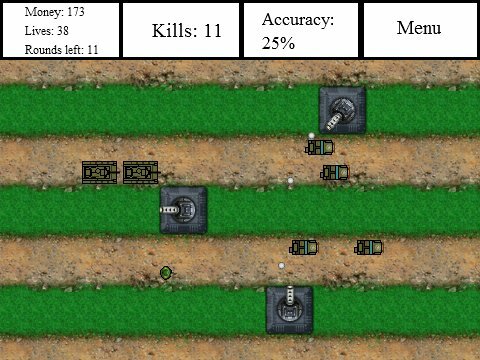 I have been working on my tower defense flash game (aptly named “TDefense”) and I’ve made some good progress so far. Now there are 3 types of enemies instead of just one, there’s a new enemy spawning system, and I’ve also put in a lot of new graphics! Most of the graphics were downloaded from OpenGameArt but I’ve adapted them to fit the game. So far balancing has been the most difficult task (not what I was expecting), but I’ll get it right eventually! An experimental mid-development build of the game can be played here. Credits: chabull, for turrets and roads. This entry was posted in gamedev, games, journal, main, projects, TDefense on July 5, 2015 by gezegond. I’ve been looking to create a JRPG style top down fantasy RPG and possibly generate income from it, but creating all the different necessary art requires a dedicated artist which I can’t afford. That’s where Open Game Art comes into picture. 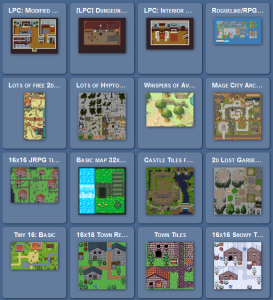 A website dedicated to free art assets for use in your games. A recent update to the website allows users to create collections of art, and it greately enhances the discoverability of the art assets on the site. 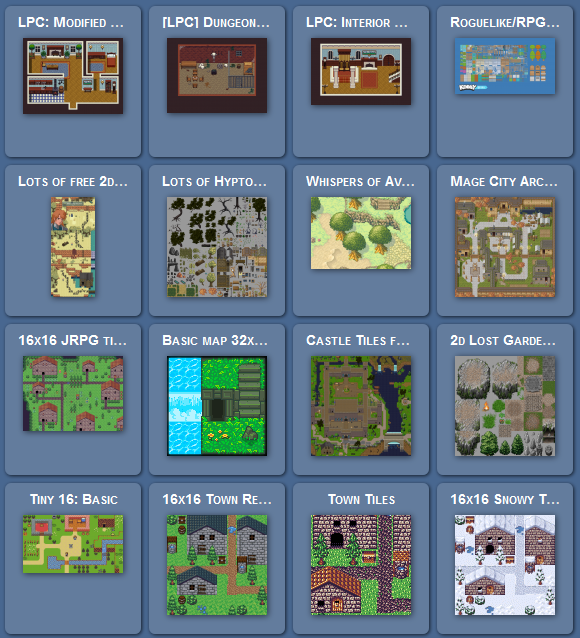 There were many collections on the site for top down RPGs, however none of them were exclusively collecting assets that can be used commercially. (CC0 and CC:BY licenses) So I made my own collection and made it public so other people can use it as well. I will tweak the collection when I find new assets. This entry was posted in gamedev, games, lists, main on June 28, 2015 by gezegond. I loved cartoons when I was a kid. You might think well all kids do, but in my case when people asked me what I wanted to be when I grew up, I replied “Animator”. That’s how much I was into them. The first time I played a game, it was at my father’s workplace (interestingly enough) playing a very very primitive 3D game on DOS which I still don’t know the name of. It was a spaceship shooter game in the same veins of “Descent”, but with very very primitive graphics. I couldn’t play on my own because it was too complicated for me, so someone else steered the ship and I pressed the fire button whenever he told me. Later I played a bunch of games here and there on computers at my dad’s workplace (notably Doom), my friend’s computer (notably Wolf 3D), on my cousin’s computer (notably Aladdin), and on my other cousin’s NES (notably Contra), amongst other places, but I didn’t have any gaming device on my own. Instead I had board games, of which I quickly grew tired of partly due to them being boring compared to computer games and partly because there was no one to play them with. I usually ended up trying to create my own variations of the board games I had by changing their rules, or make original ones using a piece of paper. I also enjoyed making comics. I didn’t know how to write so I’d just draw the pictures and ask someone else to write the text as I told them to. This entry was posted in games, journal on June 21, 2015 by gezegond. Many website and forums have built in code boxes with which you can simply use a BBCode to create a code box. These boxes are formatted with smaller text and suited for reading code, and they sometimes have syntax highlighting and line numbering features, especially if the website is mainly targeted at coders. This entry was posted in main, tiny works, web design on June 20, 2015 by gezegond. Quick progress. I integrated Open Web Analytics into my website. I initially thought it would require lots of setup and database management but fortunately it had built in support for WordPress so all I had to do was to download and copy it into my wordpress plugin folder and then activate it in wordpress. This entry was posted in journal, web design on June 20, 2015 by gezegond.